trash,1 hosted advancement token: Gain 5credit. trash,2 hosted advancement tokens: Gain 8credit. "Who knew non-profits could be so profitable?" This is one of those cards that seems innocuous but under the surface, is really, really, mean. Basically, this is Thomas Haas, but not terrible. The main purpose of this card is to bait runs and drag the runner through taxing/tagging/damaging servers only to come up empty handed. NGO Front serves this purpose very well. Variable output: Some runners are wary of a 2 advanced trap, but almost all one advanced cards will be ran. 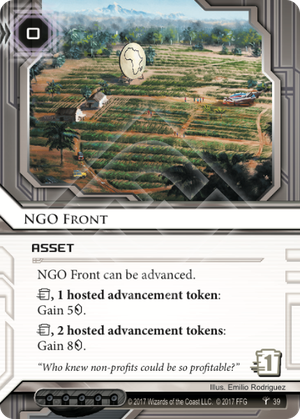 Overall, I think NGO Front will see a lot of play in Tagging or Glacier decks to encourage running and open scoring windows.